My efforts to watch more Bette Davis movies has lead me through some interesting paths. I'm still trying to figure out if I liked her earlier movies more than her latter ones - it's like she becomes a completely different actress at some point in her career and thus it's hard to compare her works with any degree of accuracy. And it's not like should have to do that either - all of them are great in one way or another. It's really just a question of what your preferred flavor is. This movie surprised me since it wasn't one that was a comedy or a typical drama. Instead it's a pretty serious suspense thriller, one that remains pretty intense despite it being in black and white. You don't need all those special effects in order to properly tell a scary story. This story wasn't quite on the level of the Hitchcock thrillers, but it's still a great story. And the team of Bette Davis and Joan Crawford make for quite the heavy-hitting cast as we watch the two of them sink down into a rather dark place indeed. 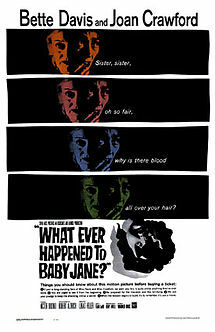 Synopsis: What Ever Happened to Baby Jane? is a 1962 psyhological thriller directed the Robert Aldrich. The screenplay was written by Lukas Heller based on a novel with the same name written by Henry Farrell. We are first introduced to young vaudeville child star Baby Jane Hudson (Julie Allred), who performs for crowds and is quite popular. In fact, they even have an expensive "Baby Jane" doll created in her likeness. We fast forward to 1935 the Baby Jane (Bette Davis) and her sister Blanche (Joan Crawford) are both movie stars in their own right. However it is Blanche who has made a career out of movies while Baby Jane's pictures have flopped. With the tables turned, Jane isn't at all happy. We then see a car pull up to their mansion as a pair of legs comes into view. Then the car bolts forward, obviously hitting whoever was in front of the vehicle. A year later we find that Blanche is now confined to a wheelchair while Baby Jane is left to care for the both of them. They have a cleaning woman, Elvira (Maidie Norman) comes by occasionally to help clean the house and such, but that's about it. And given her lack of success Baby Jane has grown to be very resentful of her sister's success and she constantly gets into arguments with Blanche. But Blanche has little choice but to endure the verbal abuse of her sister given her situation and her natural love for her sister. But things are set to take a much darker turn as Baby Jane's obsession with her former glory leads to even greater problems for Blanche. The movie first immerses you into the daily lives of Blanche and Baby Jane - and thus in time you feel like you're almost a part of the entire drama that includes quite a lot of verbal abuse and scheming through Baby Jane. She's clearly riding off of Blanche's success and going as far as impersonating her sister on the phone just to get more alcohol. And given that slippery slope, you know that her moral compass isn't exactly point north anymore and she's liable to do anything. I don't think I was fully prepared for how far she'd go over the course of the movie. The passive aggressive insults and the telephone deceptions were pretty bad to begin with. But things just get worse and worse and Blanche is left with few ways to save herself. Even her eventually "rescue" from Blanche is not precisely one that leaves you feeling better. I guess the ending could be better described as one that just leaves you feeling somewhat relieved that it's all over. The movie is quite the emotional wringer, and this just goes to show how well the director brought this movie together with the superior acting talents of Bette Davis and Joan Crawford. While there are other characters involved, the core of the movie remains the tension between their two characters. Everyone else is just so much window dressing. And given the stories off the off-camera drama between Davis and Crawford, clearly some of that energy made its way into the film. Bette Davis is downright disturbing as Baby Jane. She is truly a woman who has fallen on hard times and her lack of success has eaten away at her core. All that's left is some pretty bitter resentment and a desperate desire to somehow recapture even just a glimmer of her former glory. But it's never easy to manage a comeback - what more when your original career peak was during your childhood? What Ever Happened To Baby Jane? is a brilliant movie that may not be entirely pleasant to watch but therein lies its brilliance. It's certainly one of the more memorable movies of Bette Davis' career and one that I eagerly recommend. It rates 4.5 disturbing meals served by Baby Jane to Blanche out of a possible 5.